Venice was magical, not going to lie. Have been repeating this for couple times already, but cannot help myself to get rid of the beautiful scenery of Venice from my head. It was a great time spent around the canals and definitely not a last visit. However, Venice is very touristic place. It is great and leave you with strong impact for your first and second visit maybe. But if staying longer, I am questioning myself what else is there to do? One thing if I can advice you for any first visitors, try to walk a lot and get lost around Venice. You'll find so many pretty hidden corners and shops and it is just worth to be lost. This public square is the biggest and major touristic point in Venice. You may be able to see four major tourist attractions in one square - St. Mark's basilica, Doge's palace and Torre dell' Orologio and Campanille. Standing at San Marco piazza and being surrounded by the magnificent buildings feels overwhelmed. There are many coffe shops on the piazza as well and every evening a small orchestra plays to enhance the great atmosphere on the square. Grand Canal forms the major water traffic of Venice. One of the end of the canal leads into the lagoon near the Santa Lucia railway station, and the other end leads into the basin at San Marco. Grand Canal runs in the S shape through the central district of Venice. Explore the canals using water buses, gondolas or water taxis. Venice art scene is at the peak with its annual la Biennale art festival or craft festivals. They have many museums around the city and it is up to you in which you are interested in, whether it will be art, contemporary art or history. Among the top museums in Venice, you should consider to visit Museo Correr, Gallerie dell' Accademia, Peggy Guggenheim Collection, Punta Della Dogana or Ca' Rezzonico. This bridge is located near San Marco piazza, just next to the Doge's Palace. The bridge is made of white limestone and passes over the Rio di Palazzo and connects the New Prison (Prigioni Nuove) to Doge's Palace. Ponte di Rialto is one of the four bridges across Grand Canal. This bridge is one of the oldest bridge which divides the district of Sanc Marco and San Polo. The area round the bridge is very vibrant during the evenings. A great location for eating out or having a drink. This building is known especially for its spiral multi-arch stairway. On one of the floor you may find an art exhibition and you may walk up on the top floor for some magical views over Venice. This place is very quiet and less touristic and that's way it was worth a visit for a view. We were just basically alone on the rooftop. Murano island is known for glass workshops and Burano is known for its colourful houses. These two are not the only islands on Venice. Venice is a floating city with 118 submerged islands. Giudecca is an another island lagoon. In this part of neighborhood you can visit Punta Della Dogana or Redentore church. Come around to see how does a gondola workshop look like at San Trovaso. It is the only gondola workshop place that I have actually found in Venice. Gondola cruises are one of the major attractions for tourists and one of many images of Venice. Make sure to make your research on prices first before hopping to one. An annual Carnival held in February is known for distinctive masks. Venice carnival is a huge celebration with pardes, asquerade balls, entertainment, music and parties. This canival started back in 1162 when townspeople celebrated a victory over the Patriarch of Aquileia. Venice is pretty small but as it is surrounded by canals, you tend to walk around a lot until you will find a bridge or a pathway. However, the easiest way to get around is by a boat bus. A boat bus is totally common way of transport in Venice. Apart from that, if you wish to take a gondola or water taxi, you may also. There are two major boat lines (1 and 2) and you should purchase tickets in advance from kiosks or ticket booths at each stations. Don't forget to validate your ticket before entering the boat and also do check the direction of the boat before getting in! Ticket prices for a bus boat are pretty pricey. One way (up to 75 min from a ticket validation) cost €7.50 or a day travel card would cost you €20. 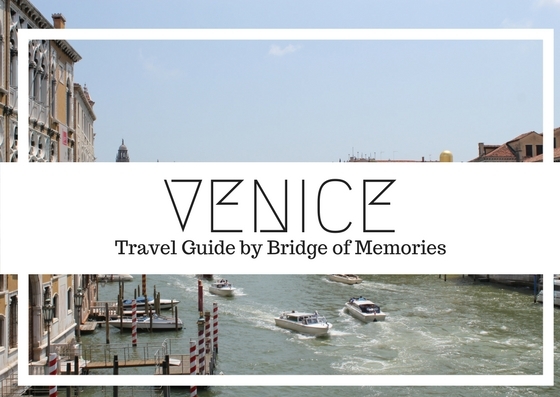 Where to eat and drink in Venice? Where to shop in Venice? 5. Mondo Novo for great carnival masks, even if you are not going, it is worth to see browse this place. There are many more places where to buy and see the workshop of masks though! Venice has two closest airports and neither of them are on an island. It will be either Marco Polo airport or Treviso airport. Marco Polo airport is the closest airport to Venice and you can get boat buses or the normal bus to get to Venice. If you will take a bus or train to Venice, it will get you at the north of the island where all vehicle transports will stop. During our stay in Milan, we have booked Casanovo Hotel to accommodate us in and it was a great experience. Located just few min away from San Marco piazza and next door to luxurious brands, it was a great location to start off exploration of Venice. Make sure to book it in advance, as Venice is pretty popular place and the great accommodation locations are booked up pretty fast. Make your booking though Booking.com and get £15 off from your booking!